Many people often use the terms barbecuing and grilling interchangeably, but they are two completely different cooking processes. While grilling refers to food that is cooked over high heat (cooked directly over the heat or cooked indirectly, away from the heat source), barbecuing refers to foods that are cooked with low heat in a long, slow, indirect heat cooking process. The low heat of barbecuing is generated by smoldering logs or wood chips that are used to smoke-cook the food. The fuel and heat source for barbecuing are separate from the cooking chamber; however, the cooking chamber contains enough heat to properly cook the food over a long period of time. The cooking chamber fills with smoke, giving the food its characteristic smoked flavor, which varies depending on the type of wood that is used for the fuel. A pan of liquid can be placed in the chamber to produce extra moisture and to keep the turkey from drying out. The best temperature for barbecuing is between 200°F and 300°F, although for turkey and other poultry, the temperature should be closer to 300°F so that harmful bacteria that may be present on the bird is killed within a safe period of time. It is safe to barbecue a turkey as long as it is not too large. A turkey no larger than 12 pounds is best. Because of the lower cooking temperature used in barbecuing, the internal temperature of a large turkey may not reach the proper level for a long period of time, resulting in an extended period in which harmful bacteria may grow inside the turkey. A small turkey will cook more rapidly than a large turkey; therefore, the internal temperature of the bird will reach a safe temperature before harmful bacteria have a chance to multiply. A cooking time of 20 to 30 minutes per pound should be allowed for a turkey of 12 pounds or less. Turkey pieces that are barbecued will, of course, reach the proper doneness in a shorter period of time than a whole turkey. Another cooking method that is similar to barbecuing is smoking. The primary difference between smoking food and barbecuing food is that with a smoker unit, the heat source is fueled by gas, electricity, or charcoal rather than wood. Also, when food is smoked, a liquid is required to produce the moist heat and smoke that are necessary to cook the food. The liquid may be simply water, or it can be wine, beer, vegetable and fruit juices, or meat stocks and broths, to name a few. The smoker should be preheated to a minimum temperature of 250°F before the turkey is placed inside and the liquid must be replenished during the cooking process in order to maintain the proper temperature and moisture in the cooking chamber. using a traditional barbecue or smoker unit. Never stuff a whole turkey that is going to be barbecued or smoked because the stuffing will require too much time to reach the proper safe temperature of at least 165°F. Stuffing that is barbecued or smoked will develop an unpleasant taste, which is another reason for omitting it. 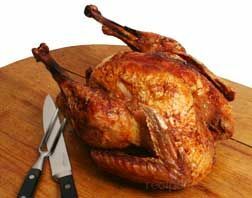 Turkey may require additional time to reach the proper doneness if it is barbecued or smoked on a cold day. A meat thermometer should be used to check the internal temperature of the turkey to ensure proper doneness. The breast should be at least 170ºF and the thigh should be 180ºF. Never allow children or pets near the barbecue or smoker unit. 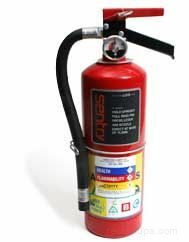 A fire extinguisher should be handy while the equipment is in use.